Over the weekend, President Obama’s administration conducted a “soft launch” of CuidadoDeSalud.gov, a Spanish-language version of Healthcare.gov that promises to make signing up for an insurance plan as easy as one, two, three — or should I say — uno, dos, tres. The Spanish version of Healthcare.gov is currently being tested out by advocacy groups including the League of United Latin American Citizens (LULAC) before its official launch. 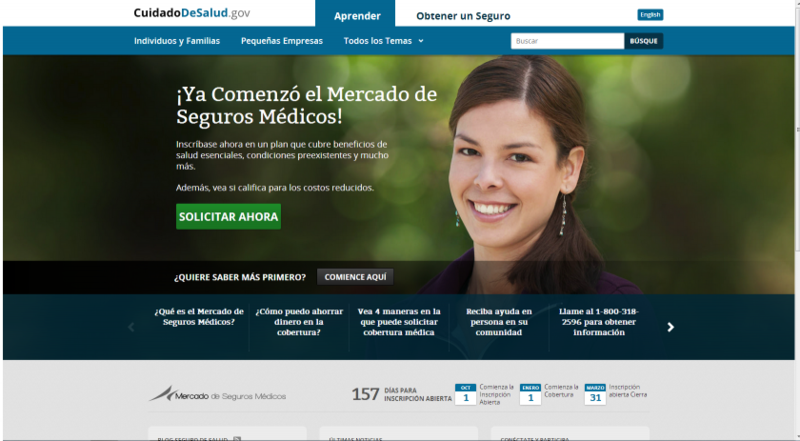 CuidadoDeSalud.gov was scheduled to launch alongside Healthcare.gov on Oct. 1, but the online marketplace's unsuccessful start pushed its starting date back as well. The Department of Health and Human Services (HHS) recently announced the postponement of the health care enrollment deadline for January coverage by a week. According to the HHS, one in three Latin Americans is uninsured, making Latinos the highest uninsured demographic in the country. CuidadoDeSalud.gov is being touted as the first Spanish-language website where individuals can go to peruse both private and public health coverage options. There are currently six organizations with Spanish speaking employees testing out the experimental CuidadoDeSalud.gov before an outreach campaign starts in January. "This weekend, we will soft launch the consumer-friendly Spanish online enrollment tool CuidadoDeSalud.gov,” HHS spokeswoman Joanne Peters said in a statement. "We think it’s important to work closely with key stakeholders in this effort and get their feedback to improve the experience. Shortly after and into January, we will ramp up our promotional efforts to drive Spanish speakers to CuidadoDeSalud.gov."